3 hours playing with breaks. Own electronic stage piano available for small additional fee. 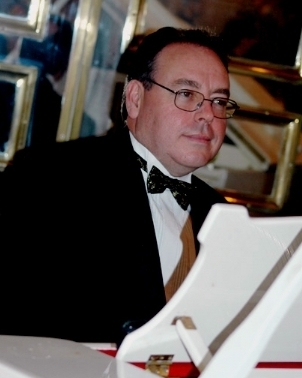 With a vast repertoire of music from Cole Porter to Coldplay, Brian Ash has something to suit all tastes including jazz, Latin, pop, contemporary, Great American Songbook classics, show tunes, film themes, soul and rock. And Brian is always happy to take requests - if you have particular favourites you would like to hear let him know in advance and he will make sure he includes them. Brian Ash has many years of experience playing at a wide range of events from corporate functions to wedding receptions. Venues he has played at include The Savoy, Claridges, Grosvenor House, The Berkeley, The Connaught, Highclere Castle, Cliveden, The Café Royal, The Park Lane Hilton, The Carlton Tower and many other hotels and country houses throughout the UK. Our quote is based on Brian playing for up to three hours (with breaks) and if an acoustic piano is not available at your venue, he can bring his own first class digital electric piano and PA for a small additional fee. He can also arrange hire of a "real" piano if preferred (subject to individual quotation depending on location and logistics). He can dress formally or informally to suit the occasion. Brian Ash is based in London. See Pricing for details of travel costs, etc. Thanks so much – Our special request, “Everlasting Love” for our entrance was even better than we had anticipated. As for the mainly swing repertoire repertoire we asked for – you nailed it! May we thank you very much for your musical entertainment at our wedding anniversary celebrations. Many of our guests commented favourably on your playing, choice of music and your playing was just ideal for us all. Thank you very much. Just thought I would give you feedback from me and a few of my guests on Saturday. Well in a nutshell you were a hit! One friend said its the 1st time she has been to a dinner/celebration where the entertainment was just right for the occasion. Thank you for entertaining us yesterday, your music was enjoyed by everyone and just what we were hoping for.